Canterbury is a great city to get drunk in. Lots of history and interesting places to visit, two universities, loads of pubs and bars, breweries nearby… It’s not been the best place for great beer, despite the breweries, but getting drunk is easy and fun. Taking beer a little more seriously are a few new spots in town. The Foundry is about to open a brewpub and there’s La Trappiste, a sister bar to the Belgian Bar in Ramsgate which used to be the home of Ramsgate Brewery (I’ve got some stories about that place from my early drinking years, the short version includes a naked giant, some cigars, too much Delerium Tremens, being sick on the beach and a pizza…). There’s also the Bottle Shop. At home inside The Goods Shed, it’s one of the most interesting and fantastic locations for a beer shop going: it’s a farmer’s market meets a restaurant plus an off-license, with the day’s freshest ingredients sold during the day and also cooked in the restaurant on site. Tucked on one side is the Bottle Shop, a tiny enclave of beer from around the world, with lots of British bottles, a good selection of Americans and a wide choice of Mikkeller and Struise, plus many other interesting Belgians. Beyond just shelves lined with take-away bottles, it also becomes a bar at night, so if you arrive after the market finishes then you can buy your beers and sit down and enjoy in a really interesting space, surrounded by cooking and food products – it’s the sort of place that makes you really appreciate the small producer, like watching an watching an independent film in a tiny art-house cinema. 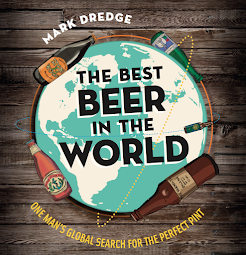 Andrew Morgan runs the place and he could talk until you’ve drunk the bar dry, recommending this or that, explaining beers, chatting about them with real enthusiasm and knowledge. He also hosts regular tastings – there’s one coming up with 19 single hop Mikkeller beers taking place at Kernel Brewery and when I’m there he’s got a table of 15 people clearly enjoying their way through 15 different bottles of trappist beer. As beer shops and bars goes, the Bottle Shop is one of the best I’ve been to: the beer range is excellent, it’s in a place which needs a boost from better beers (but also has lots of people who are drinking), it transforms from simple shop into barn bar after the market tidies up for the day, the venue is different, interesting and unique, you can always get good food (try the gouda with cumin and mustard), and they really know what they’re talking about and love what they do. I really need to pay The Bottle Shop a visit. It sounds incredible. Andrew is saying all the right things about specialist beer retail. He's a real breath of fresh air and clearly very passionate about what he's doing. There are some others who would do well to follow his example. Get down to Kernel for the Mikkeller event on 4 June if you can. Not to be missed. Bottle Shop is to my mind the best beer retailer in the UK. End of.